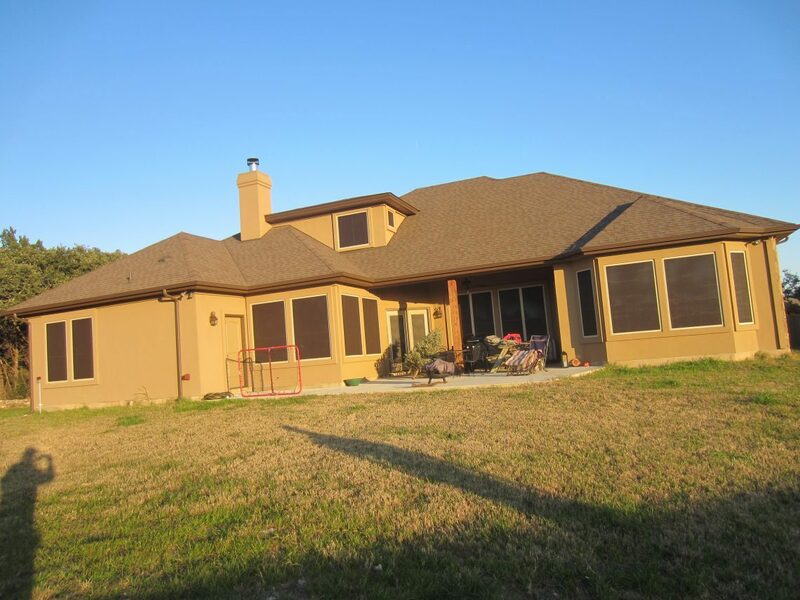 This is a home in Hudson Bend where we installed 38 solar window screens. We put a solar screen on every window for this home. We used the 80 percent solar screen fabric for the front side of the home, the left side of the home, and the right side of the home. We used the 90 percent solar screen fabric for the back side of the home, the side of the home that faces due West. It is this back side of the home that gets clobbered by the setting sun. During our long summer days, the sun can beat on west-facing windows for up to eight hours per day. Because of this, we strongly recommend using the darker and denser 90 percent solar screen fabric for these types of windows. We tell people that if you have windows which get more than four hours of direct sun, to use our 90 percent solar screen fabric, and for all other windows that get less than four hours of direct sun, to use the 80 percent solar screen fabric. The back of this home is the side that gets the four hours or more of direct sun. 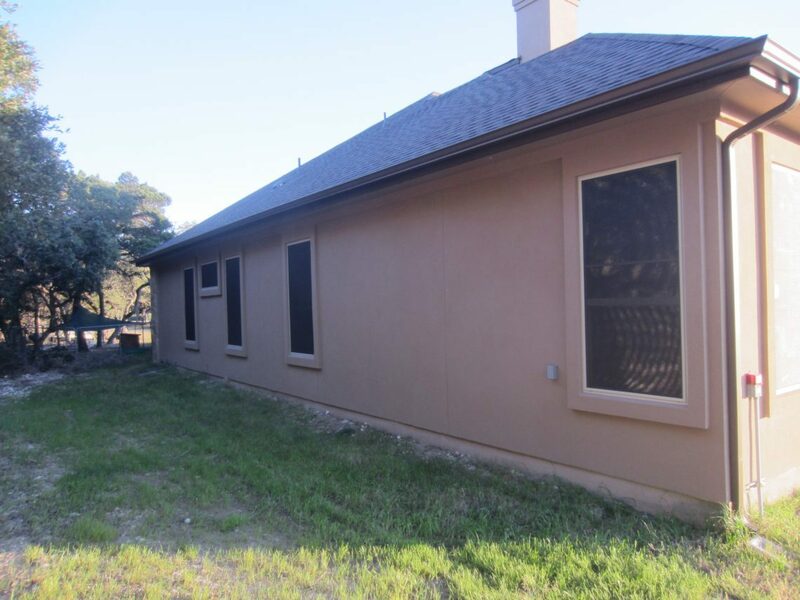 This homeowner chose to put the solar screens on all of their windows. They included that arch over the front door and the two side light windows to either side of the front door. Additionally to the right, they chose to put solar screens on the windows leading into the garage. They did this so the home would look good. If they had left some of the windows uncovered on the home, the home would have looked inconsistent and unfinished. When I am forced to leave windows uncovered, I always walk away from those houses with a feeling that the house just felt unfinished. We currently have five fabric colors. We have a dark brown fabric, which is what we used for this installation, we have a black fabric, we have a stucco fabric, a beige fabric and a light bluish looking grey fabric. These are all of the Textilene fabrics that are available in 80 and 90 percent density, made by fabric manufacturer Twitchell. By the beginning of year 2018, we should have in our possession a new light brown colored fabric. This new light brown colored fabric will look something like the stucco color of this home. It’s an adobe brown color. This is a new fabric that is exclusive to us. 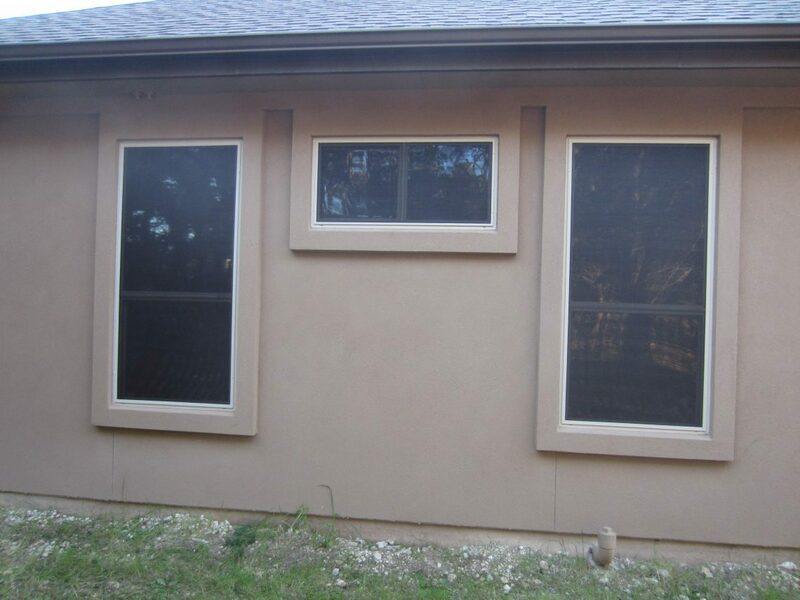 At the moment, we are the only solar window screen company in the Austin area that will have this new light brown fabric. Front of Hudson bend solar screen installation showing 14 solar window screens. 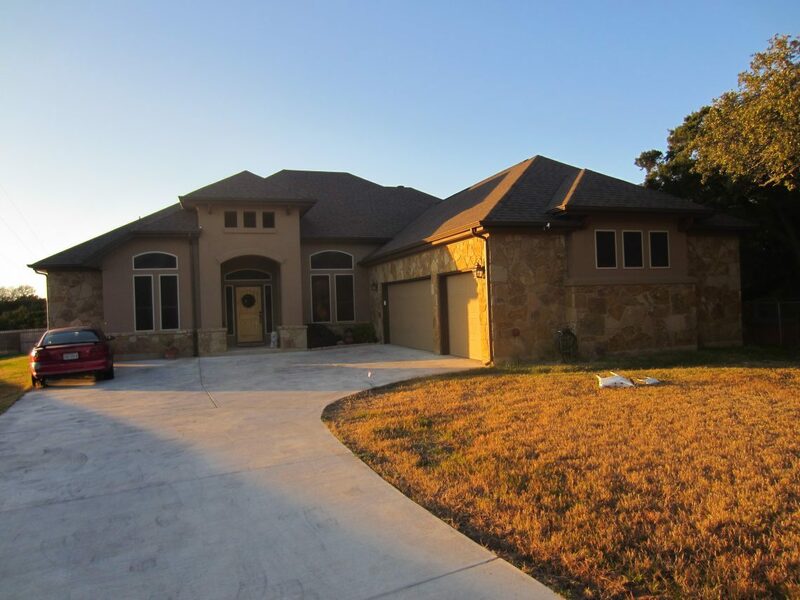 This is a new home in the Hudson Bend, Texas area. There are no established trees providing any sort of shade for this newly constructed home. So, all of these windows are in the sun at some point during day, therefore we shaded each and every one of these windows for this Hudson Bend solar window screen installation. Homes that are in established areas and neighborhoods generally will have tree cover that will provide shade for some of their windows. That’s what a solar screen does — it provides shade for your window from the exterior. The solar screens will shade the window’s glass from the sun’s rays. Solar screens are designed to fit on the outside of the window, by doing so you are providing shade for the glass and you are providing shade for the inside of the home. People will ask if they can put the sun shade window screens on the inside of the home, though that is not what they are made for; they are made to provide shade for the windows, and the inside of the home. If you need a solar screen for the inside of your windows, that is what blinds and interior roller shades are for. Or, you could use window film. Window film is installed on the inside of your window, so it provides shade for the inside of the home, but will not provide shade for your glass. And, in fact, the glass actually gets hotter from window film, because the sun’s rays are being stopped and dispersed at the inside window pane of the glass because of that window film. Window film will give you shade for the inside of your home but they will cause your windows to get considerably warmer therefore it is counterproductive when trying to keep the inside rooms cooler. Left side of Hudson bend solar screen installation showing to solar screens, on being a non open window that 70 inch wide by 9 inches tall. Here’s a picture showing the backside of the home, where we used the 90 percent solar screen fabric. All of these windows here on the backside of the home received the 90 percent solar screen fabric. We used the 90 percent solar screen fabric because this is the side of the home that gets more than four hours of direct sunlight. This homeowner did not leave any of these windows uncovered. You can see under the patio a set of French doors, and you can see where we put the 90 percent fabric solar screen on those French doors. Those doors are glass, therefore we were able to put solar screens on them. You can tell by this picture that the doors and most all of these windows are getting pounded by that afternoon sun. This side of the home is by far the hottest side of the home, therefore we used our 90 percent solar screen fabric. That 90 percent fabric is a tiny bit denser than the 80 percent fabric. The fabric looks almost like it’s solid. It’s not, and you can see through the fabric from the inside looking out incredibly well. Pretty much the opposite of what you’re seeing here. What you’re seeing here is a dark solid look, but from the inside looking out, it’s lit outside and darker inside your eyes will focus past the fabric, through the fabric and see the lit areas outside exceptionally well. Back of Hudson bend solar screen installation that received 15 90% solar screens. Here’s a great close-up of some of the 90percent solar screens. You can see many pictures of solar screens here. These solar screens are installed by directly screwing the solar screen framing to the window framing using small self tapping tech screws. The heads of our tech screws are color matched to the window framing, so the screws match the window framing. Close-up view of some 90% Austin TX Solar Window Screens. 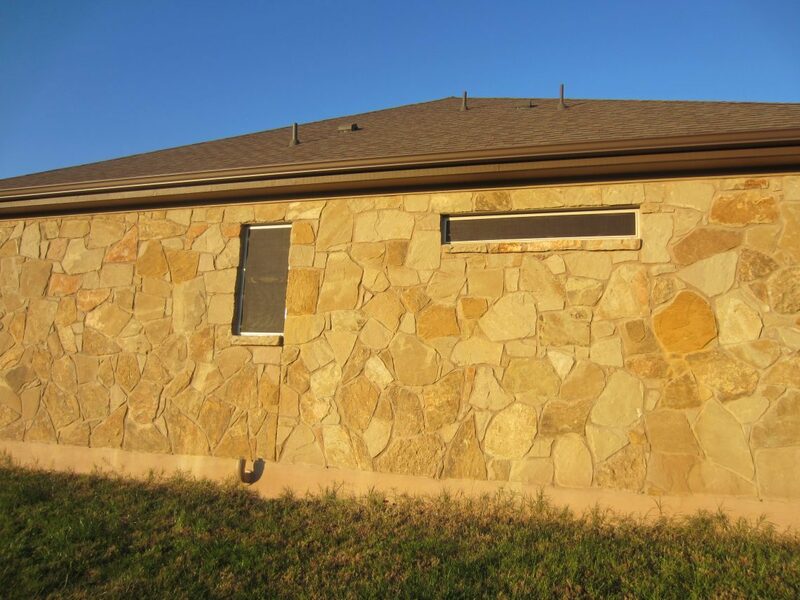 This picture is showing the right side of the home where we used our 80 percent solar screen fabric. 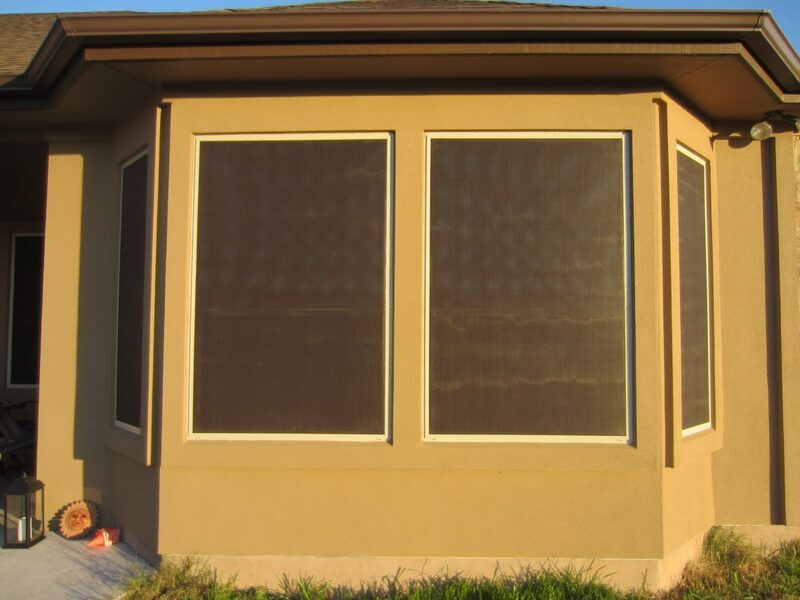 In our gallery of solar screens, we have many more pictures posted to take a look at. You can kind of tell that this fabric isn’t as dark as the above 90 percent solar screen fabric. You can see at the break in the window the white going across the window, which is the break in the window, that you can see through the fabric. You can typically see about a foot past of the fabric when it comes to the 80 percent solar screen fabric. Right side of Home showing 5 80% solar screens. These are more great illustrations showing what the 80 percent fabric looks like. And you can tell by that one window up top, that horizontal sliding window, you can tell that the solar screen was not installed over the two drain holes. You can also tell by looking at the bottom left and right corners of those 35 by 72 windows that those drain holes are not covered up there either. You never want to cover up the drain holes. Close-up view of 80% solar screens. Look how well you can see through the solar screen fabric, you can see the break in the window. Contrast that against the 90% solar screens from the above pictures. This chocolate brown solar screen fabric that we did for this Hudson bend solar screen installation is just beautiful and contrast to the Sandstone exterior. If you look over the AC there you’ll start to see some of those stones turn a darker color. That can be from water hitting the AC unit and bouncing back up onto the stone. Because there’s dust and dirt on the AC unit, that dust and dirt finds its way up to the stone from water bouncing off of the AC unit. And this is exactly what happens to that lighter colored fabric that I mentioned earlier. The lighter colored fabrics, the stucco, beige and gray fabrics will at some point look like this. They will get dark and dirty. Not all of them will, just those that get polluted with roofing tar, or when water bounces off of the window sills bringing with it all the nastiness of the windowsill. 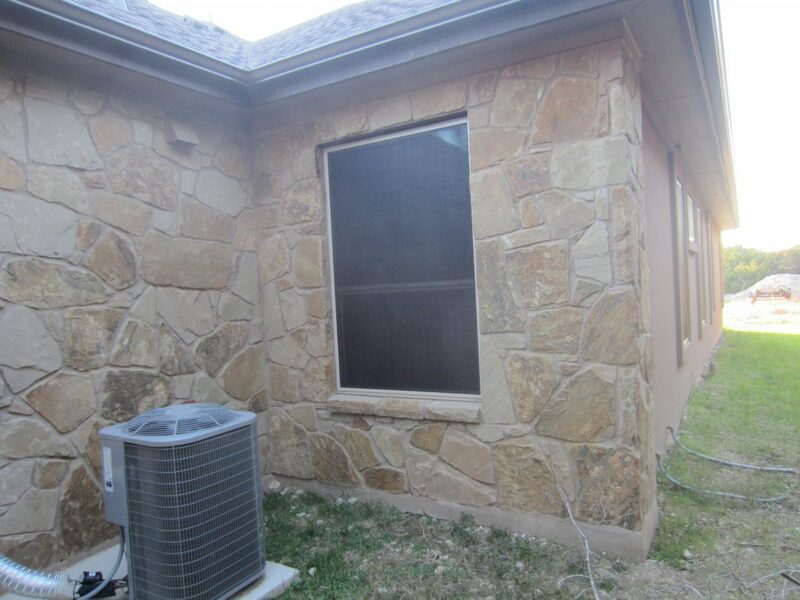 This brown solar screen fabric looks outstanding against the sand stone exterior. So, are you ready to have solar window screens installed on your own home? Check out our service area, and read plenty of reviews from our shade screen customers here. Contact the Austin Shade Team today to learn more.